Velvet Belly Lanternshark - Etmopterus spinax. Common Names: Velvet Belly Lanternshark, Velvet belly shark. 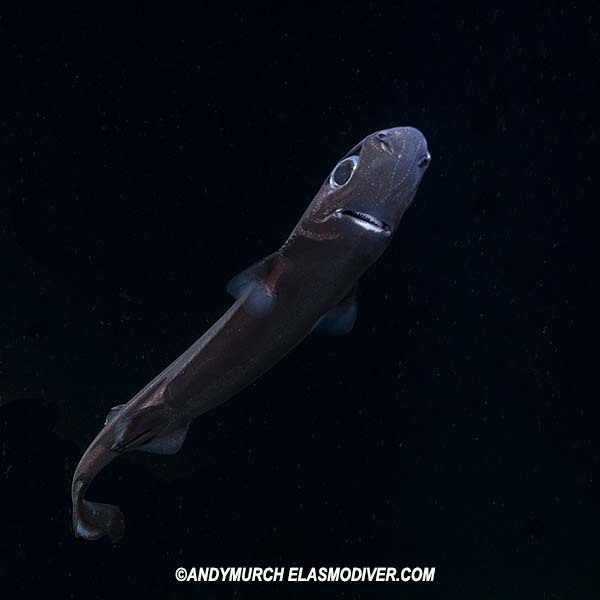 Family: Etmopteridae - Lantern sharks. Identification: A small, redish brown shark with metallic-looking skin. Belly blackédark and non-reflective. Fins small and bluish-grey with dark mottling at bases and along trailing edge of caudal fin. Both dorsal fins have thin fin-spines on their leading edges. Second dorsal fin-spine longer than first. Snout wide and rounded. Distinct line of ampulae of lorenzini on forehead from tip of snout, extending backwards above each eye. Two parallel lines of ampulae on underside of snout converge near the mouth. Upper teeth small with one narrow central cusp and up to three pairs of lateral cusplets. Lower teeth larger with a slanted blade-like cusp and interlocking bases. Eyes large and round. Spiracles small. Five small gill slits. Size: Maximum recorded length 41cm. Unconfirmed to 60cm. 9-14cm at birth. Habitat: Silt, sand or rocky substrates on continental shelves. Sometimes well above the bottom. Listed as occurring from 70m to 2000m but juveniles (and possibly adults) enter shallow water (35m) in Norwegian fiords where sunlight is blocked by surface runoff. Distribution: Northeastern Atlantic Ocean. Common in deep water around Norway, Iceland and the British Isles. Also present in the western Mediterranean and along the west coast of Africa as far south as Gabon. Diet and feeding behavior: Juveniles feed mostly on krill and small invertebrates. Adults prefer bony fishes, squid and crustaceans. Reproduction: Viviparous. 1-21 pups per litter. Conservation Status: Listed as LEAST CONCERN by the IUCN. A non-commercial species, all specimens captured as bycatch by commercial fishing vessels are discarded thus limiting the data available. Data from the Mediterranean Sea, Eastern Central and South Atlantic indicate that the species is still relatively commonly caught in scientific trawl surveys and there is no evidence that the population has declined there. A recently introduced ban on bottom trawling below 1,000 m depth in the Mediterranean Sea will afford it protection there. Deepwater fisheries also operate off the coast of western Africa, but these are relatively limited at this time. However, deepwater fisheries are intense in the Northeast Atlantic and scientific trawl surveys indicate that catch rates of this species declined by approaching 20% between the 1970s and 1998–2004. This species shows size structure segregation with depth. The deeper-occurring larger mature female sharks are probably more affected by the commercial deepwater fisheries operating in the Northeast Atlantic than the immature stages that are found in shallower waters. An assessment of Near Threatened is warranted in the Northeast Atlantic, given the apparent decline and continued, intense deepwater fishing pressure. Elsewhere and globally, the species is assessed as Least Concern because there is no evidence for population decline throughout the rest of its range and there are areas of refuge from fishing pressure. 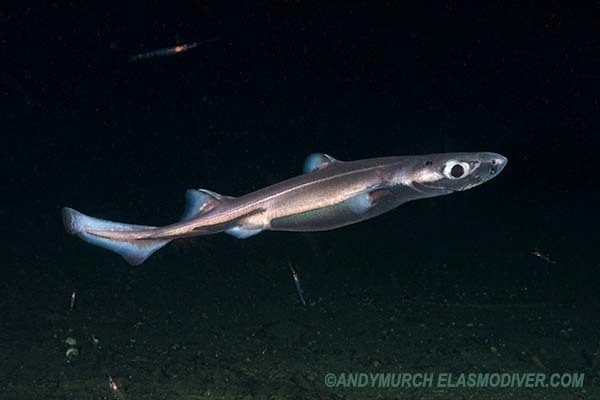 Continued monitoring is required to ensure that this species is not detrimentally affected by expanding deepwater fisheries in the future, particularly in the Eastern Central and Southeast Atlantic. 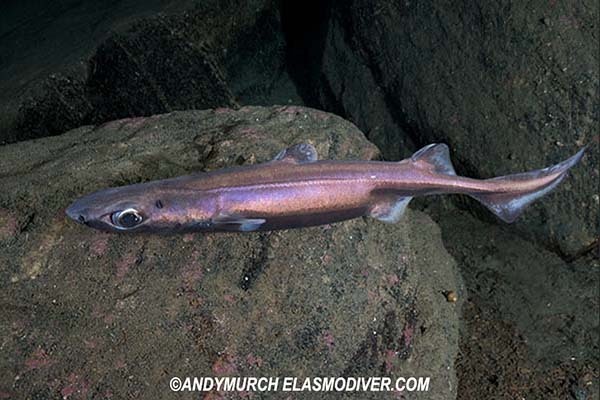 Smooth Lanternshark - Etmopterus pusillus - has a more laterally pointed snout and no black areas on its belly. Great Lanternshark - Etmopterus princeps - much larger and more robust. Snout is squared off. Reaction to divers: Nonchalant around divers in baited situations. Velvet belly sharks are relatively easy to attract to bait. Once in the area and fixated on the food, they often stay within a few meters of divers even when caught in the beam of powerful lights. Diving logistics: Velvet bellies can be found in Namsen Fiord and various other Norwegian fiords where runoff causes a murky layer at the surface which prevents daylight from reaching deep water. Big Fish Expeditions runs yearly deep water shark trips in Norway each September. 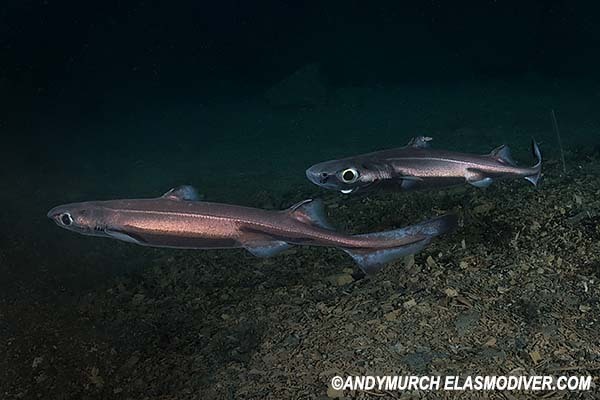 During these trips, divers can expect to encounter velvetbelly lanternsharks, blackmouth catsharks, chimaeras, skates and numerous other deepwater species: Deep water shark expedition. Coelho, R. Blasdale, T., Mancusi, C., Serena, F., Guallart, J., Ungaro, N., Litvinov, F., Crozier, P. & Stenberg, C. 2009. Etmopterus spinax. The IUCN Red List of Threatened Species 2009: e.T161388A5412576. http://dx.doi.org/10.2305/IUCN.UK.2009-2.RLTS.T161388A5412576.en. Downloaded on 10 December 2018.